Ah, brunch, a true unifier of all food lovers. The word alone exudes joy. I am truly at my happiest and in my element when I’m brunching (yes, it can be used as a verb). Give me a gourmet Santa Fe breakfast sandwich with a glass of mango juice and you’ll see true happiness. Lucky for me, I am surrounded by other brunch lovers in my life, which means many Sunday mid-morning meals. As a Philadelphian, I’m also privileged to some of the best cuisine in the world (you’ll never have a finer roast beef sandwich than here), and I’m always on the prowl for the next great brunch. So with that, I give you my best brunch of the greater Philadelphia area. Talula’s Garden It would be wrong of me not to begin with my #1 pick, Talula’s Garden. Talula’s Garden has everything you’re looking for in a brunch: breathtaking atmosphere, wonderful ambiance, unreal crisp potatoes (aka hash browns) and the best coffee I can recall ever having. When I arrived here for my first experience, I walked through a stunning garden to find my party sitting at an elegant wooden table surrounded by flowers and hanging lights. It’s easy to see, and taste, why this is such a popular brunch spot, and reservations are a necessity. Tela’s Market & Kitchen Another fantastic spot I recently visited is Tela’s Market in Fairmount, where the sriracha was bountiful. I had the most incredible breakfast burrito, my iced coffee was strong and flavorful, and my hash browns were crisped and seasoned to perfection. Spread Bagelry The word ‘bagelry’ makes me so happy. Spread Bagelry is my jam, literally (please laugh); this bagel above features Amish jam, bacon, egg, cheese and tomato and is absolutely exquisite. Spread creates fresh and delicious Montreal-style wood oven bagels, which I didn’t know was a thing but I’m glad I do now. Seven Stones Cafe Another gem I recently discovered is Seven Stones Cafe in Media, PA and it’s becoming my new favorite cafe. It’s tucked away from Main Street, and decorated with local art pieces. After leaving behind Penn State’s Irving’s post college graduation, there was a severe lack of artsy cafe in my life until I came across this location. There is always a delicious soup du jour, and the breakfast sandwiches are excellent. Fractured Prune Finally, we travel south of Philly and into New Jersey for some of the best and most colorful doughnuts you could ever consume at the Fractured Prune. You may have guessed already by the name, but this is a quirky and unique doughnut shop. After placing an order, you’re given a playing card, nine of spades for example, as your order ticket. Doughnuts are dipped right in front of you as well; doesn’t get much fresher than that. May I suggest the Blueberry Cobbler? Sabrina’s Cafe I recently went to this next hot spot, Sabrina’s Cafe, for my birthday. 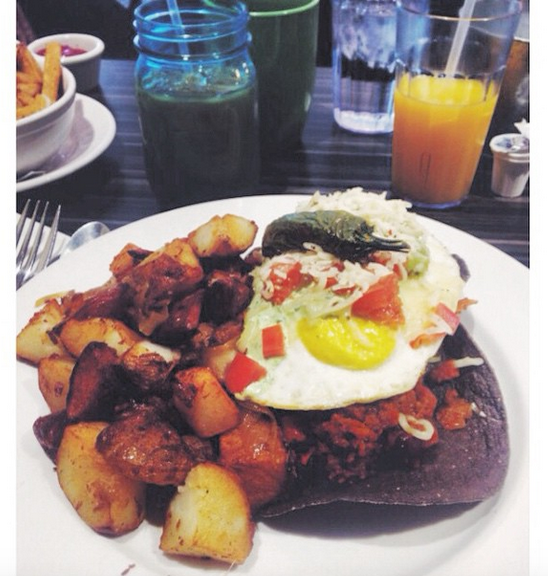 Pictured above is their divine huevos rancheros. They’re also famous for their challah french toast. There’s multiple locations, both in Philadelphia and outside of the city, which makes it convenient to get your french toast fix. There are obviously many great spots that I’ve missed in this area that I haven’t been to yet. SO, I am asking you, what is your favorite brunch spot? I’m looking forward to hearing your suggestions and preparing my next trip!